When it comes to baking, chocolate is a very popular selection, and that’s no exception here at Green’s Cakes. We love chocolate, and we want you to love your chocolatey baking with minimal effort! See our range of chocolate treats and add them to your home baking list today! 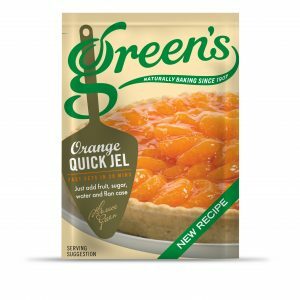 Whether it’s a chocolate cake mix or a traditional Blancmange, we know that with Green’s you will love what you created. As will your family and friends, who will be amazed at the ease of use but great results you get by using Green’s products. Mix up a batch of these delicious, mouth-watering chewy fudge brownies with Belgian chocolate chunks! It’s so quick to just whip up, bake, and dig in. A traditional milky dessert, follow the instructions then set in the fridge for 3 hours and serve your Pearce Duff Chocolate Blancmange! This chocolatey treat is so easy to make and can be enjoyed by all your family and friends, so try it today. Traditional milky dessert, available as a multipack containing one sachet each of Strawberry, Vanilla, Chocolate and Raspberry flavour. Follow the instructions then set in the fridge for 3 hours and serve your Pearce Duff Blancmange!